I am one very lucky girl. 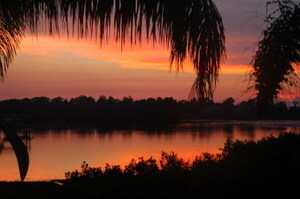 My husband and I live in a beautiful home which overlooks the Gulf of Mexico. It is 7:00 PM; the temperature is 58 degrees, which for this time of year is cold. I know… you are not feeling sorry for me right about now. The sun is sitting low in the sky and I am anticipating the beautiful sunset that we often see from our decks. 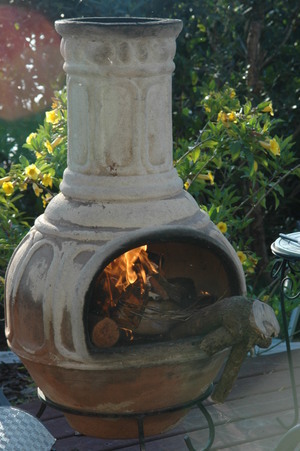 I have a fire going in our southwestern style chiminea and I am typing this post fireside, with the breeze blowing. The only thing missing is my husband, who had a previous commitment. You see, he is a member of something called the Temple of Fitness. It sounds religious, but it isn’t at all. It is a fraternal group of guys committed to keeping in shape. Good mission, no doubt. 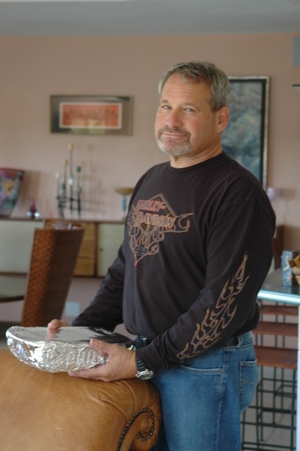 The founder of this group is a soulful Italian American who commands a tremendous amount of respect from all who know him, for he is a leader, a mentor, and for our narrow purposes, a wonderful foodie. Everyone calls him Coach. So, my husband planned to leave our home this magnificent evening to attend his annual “Godfather” meeting with his Temple of Fitness buddies. Yes, they watch the Godfather movies at this event but they also cook great pasta, Italian sauce and other wonderful Italian specialties. You will meet Coach, his son and some of the other members of his wonderful Italian family in a future post. Throughout the afternoon, I was perplexed. What would a good Jewish man do on Passover when all of this wonderful pasta was to be served? Would he remain true to his heritage? Would he succumb to the temptations of the scrumptious, aromatic sauce on the stove that would soon grace the perfectly al dente pasta? Being the good Jewish wife that I am, I didn’t want to give him the choice. So I baked a Matzo Lasagne! I had seen recipes for this dish in various Jewish cookbooks, but had never attempted to make it. As my friend often says, the juice wasn’t worth the squeeze. But tonight seemed like the perfect occasion. 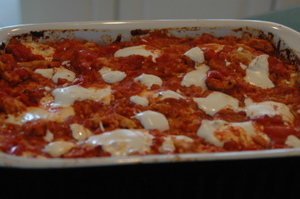 So, I made a bought some wonderful buffalo mozzarella, made a quickie tomato sauce from San Marzano tomatoes, sautéed garlic, onions and ground beef; layered it just like a traditional lasagna noodle casserole and voila (or should I say alora) matzo lasagna was ready for my husband to take to his dinner. Only one more detail to negotiate. He was going to ride his Harley to his friend’s home. Alas, where would he put the Matzo Lasagne? Never fear; when a true HOG wants to ride, he can find a way. He put it on its side in the saddle bag! Good thing I really didn’t care about the integrity of the dish. It really was all about preserving our religious tradition and at the same time, giving him the opportunity to participate in this sacred, male bonding experience. We will have to wait until the comments to this post come in to determine if the culinary experience was worthwhile. PS. The sun has set and it is a another beautiful night in Paradise! Love the look on Evan's face. You guys crack me up. And you are right -- I don't feel sorry for you. It's below freezing here in Indiana. The asparagus is frozen in the ground and the daffodils have bowed their cheery little heads. I am cherishing memories of sitting around your chiminea. I am a very lucky man. The Matzo Lasagne was outstanding. It had plenty of the "zets" from whatever the spices were, and layered just like Italian Lasagne but lacking the aldente quality of the pasta. it's hard to get that when you first soak the Matzo in water to soften them up I guess. I also appreciated being able to stick to my tradition. The guys I hang with are wonderful. They appreciate a committment to one's heritage and are committed to their family traditions in lots of ways. We did get a laugh out of Cruda trying it and with a bit of a frown saying "well its the best matzo lasagne i have ever had (never having had it). i was sorry not be be able to share the fire and sunset with you but it is so good to be with the guys acting stupid, eating great food, laughing at all things politically incorrect at best and bawdy at worst. You and I will have lots of campfires and sunsets. Now lets get The Coach to post a blog. his knowledge of food and wine would make great reading. Needless to say, I also do not feel sorry for you. You live in a veritable paradise, doing things that you enjoy with the love of your life. You did good, kid. For the record, though, Evan hit the jackpot with you. I sorely missed not being able to attend one of our less sacred, yet pleasurable Meetings. Yes, I am one of them... A Templar. I also hold the distinction of bringing "The Rear Admiral" (insert joke here), Evan, to our midst. It is and has been an honor to do so. I look forward to your musings on The Temple and the "high wall" family. The Coach has been a second father to myself and many of our crew. I have faith that you will properly convey our thoughts & feelings along with your own. A follow-up newsletter is being prepared as we speak, I'm sure, discussing last night's happenings. The review on said lasagne will be included. I am quite interested to read all about it. Think of "The Giant" while overlooking the Gulf and know that he looks down from the Georgia hills upon you both with great pride and admiration :). Did you soak the matzoh first, or use it right from the box? I've tried in both ways.... it's fun to live in a household with more than one tradition to celebrate, isn't it? Pass The "Lotsa Matzo For Pasta" Lasagna! My good friend is a very lucky man! He happens to be married to an great woman and "foodie." I was fortunate to try my first Matzo based lasagna this past weekend. This must be the first door to door delivery of Matzo Lasagna on a Harley Daividsen....at least in Florida if not the U.S.
Well it was the best "Matzo Lasagna I have ever tasted" as one of our friends said. I liked the way the matzo was almost in the form of a long grain rice in shape-but this could have been from the wild Harley ride as well-(we are awaiting video of traffic intersection lights to confirm this). It had bits of sauteed garlic done very nicely and the matzo was dense and moist. The San MArzano tomatoes were terrific. If tomatoes went to the Oscars and walked the red carpet-they would all wish to be wearing San MArzano skins! They are the best, most sweet and flavorful tomatoes I have ever had. Some nice Mozz. to round it out-Ronnie did a great job! Evan and our crew enjoyed the Matzo and we were all impressed with Ronnie's efforts once again. This lady can flat out cook! Great Time and Great Matzo Lasagne. Thanks for the compliments and your musings about the other night. I need you for a guest post!